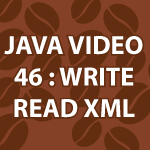 Today I introduce the easiest way to read and write to XML files using Java. It is call the JDOM2 library. With it you’ll easily read any element, or attribute and create your own. I introduce 10 libraries and show you numerous methods that will make your life easier in just 14 minutes! All of the code follows the video to improve the learning process. Very, very nice Tutorial. I did not know anything of that. But now I can write and read XML easily. One simple Question: When I want to write for example the country more than once (with different content), do I have to define a new Element or could I use the created one? Hi Derek, how it’s different from dom parsing ?? I feel there is no difference then why jdom ?? Can you throw some light on this ? Hi Derek, this is an off-topic question, but still I want to ask. In your videos I see how quickly you type/replace/fill in some things, I do know about ctrl+space combination, but do you use any other tricks? Or it is just you so dexterous ? 🙂 And what do you think of making tutorial on that, if there’s any trick of course?